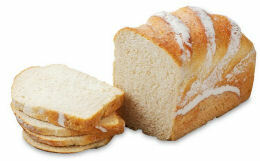 Lovely White Loaf; ideal for sandwiches, toasting. Established in 1920 in the Cotswolds, Hobbs House is a truly family business and is proud to have five generations of baking experience. Using traditional methods, Hobbs expert team of bakers continue to produce an exceptional range of award winning breads to the very highest standards, available here at The Cheese and Wine Shop. White wheat flour, fresh yeast, salt, non-hydrogenated shortening, Vitamin C, water.